I have a love/hate relationship with Amazon. As a consumer, I love the one-stop shopping aspect of Amazon. I love free 2-day shipping (I pay for Prime, but the shipping feels free), and I think it’s clever how Amazon uses various incentives to encourage you not to use 2-day shipping when you’re not in a rush. I also like that I can buy anything with just a few clicks. As a publisher, I acknowledge that a lot of people look for our games on Amazon, but I worry about the “race to the bottom” in terms of pricing, which impacts other online sellers too. I appreciate that Amazon offers a brand registry program, but it’s also frustrating that it’s so easy for someone to change a product listing. It’s also frustrating that some retailers and consumers think that Stonemaier Games either sells on Amazon or has control over how our products are sold on Amazon. Publisher: Stonemaier Games hasn’t sold anything directly through Amazon in years–we’re a publisher, not a vendor. With my first few Kickstarter project, I used Amazon’s fulfillment service to ship rewards, and then I sold excess inventory via Amazon FBA. I stopped doing that a long time ago because of their poor packaging practices, among other reasons. Featured Sellers: If you’ve purchased a product on Amazon, you’ve probably clicked the “Add to Cart” button in the upper right. This is the “buy box,” and it either means you’re buying from Amazon itself (as a retailer) or–if Amazon doesn’t carry the product–from a featured seller selected by Amazon. In the example below, Amazon has selected allstartradingcardsandgames, but after they make a sale, Amazon will rotate to a different seller. Third-Party Retailers: You can also buy from “Other Sellers on Amazon.” These are third-party vendors selling through Amazon. They could be anyone–a brick and mortar store, an online store, or even an individual with a single copy of the game to sell. Even though I keep an eye on how our products are being listed on Amazon, I really don’t know much about what’s going on behind the scenes there and what I can do as a publisher to better serve the consumers, retailers, and distributors who are impacted by Amazon, either directly or indirectly. So I reached out to Hasan Hasmani of SamePageBranding to see if he would share his thoughts and expertise on Amazon. The service–created with game designer Charlie Bink–empowers board game designers and publishers to create their own presence on Amazon while recognizing the unique challenges in the board game industry. The result is the interview you’ll find below, which is an edited compilation of a back-and-forth e-mail conversation we had last week. Given that Amazon is such a huge competitor to brick & mortar retailers and even other online stores, do you think it’s possible for a publisher to maintain a good relationship with those retailers while also selling through Amazon? Or do you think publishers need to choose one or the other (traditional distribution or direct sales through Amazon and their website)? Thank you for taking the time to interview and giving me an opportunity to talk about this subject. I absolutely think game designers and publishers can maintain a great relationship with outside retailers while selling on Amazon. I’ll present a case as to why selling your own products on Amazon will foster the best and most mutually beneficial relationships between retail stores and publishers. The biggest challenge to Brick and Mortar stores is the deep discounting and devaluation of products because of the heavily competitive landscape of Amazon. It becomes hard to support your friendly local game store (FLGS) at $60 for a game if they can buy it on Amazon for $38. For the board game industry to thrive, friendly local game stores that offer a great experience aside from just buying and selling games (cafes, pubs, tournament-style spaces) are going to be crucial. These spaces create communities that expand and enrich the board game audience. Unfortunately, even the best game stores will suffer if publishers don’t control the distribution of their product on Amazon. Amazon and other 3rd-Party Sellers is notorious for lowering the prices much lower than the intended MSRP and not following any MAP agreements. The result of this is that many well-meaning publishers are forcing game stores to compete with Amazon’s unrealistic discounts. Taking control over the Amazon listing by being the only seller or working with an exclusive partner gives you more of an opportunity to establish a mutually beneficial relationship with the stores and even with distributors. 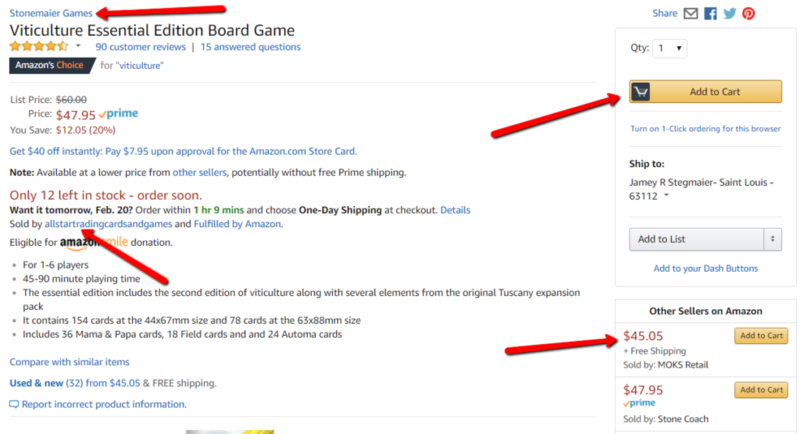 Distributors can still fulfill their function of providing games to board game stores (with an understanding not to sell to other Amazon sellers), and YOU can sell directly to the consumer. It’s a win-win scenario. Your products will be sold on Amazon whether or not you decide to sell it yourself. We want to empower designers and publishers to create their own presence on the platform and leverage the largest online marketplace in the world to grow their company. As some of your blog posts have highlighted, creators are faced with a lot of challenges when selling products on Amazon. Our goal as a company is to help designers and publishers establish a presence on Amazon without having to suffer through the steep learning curve. There was a time when I sold some of our products on Amazon, and I struggled with the quality of their packaging, the impersonal nature of their customer service (it feels like you’re working with a huge company, which they are), and their brand management (it’s super easy for any seller to change information about your product). Has the company evolved, or do you still see those types of issues arising? Packaging: Amazon’s packaging has a very high percentage of no-issue deliveries, and its speed of delivery is faster than most services available. Additionally, their customer service to consumers is top notch and they are known to handle complaints swiftly and with expertise. Customer Service: Understanding the platform and how complaints get resolved is part of the learning curve when selling on Amazon. For example, the department that handles the inbound shipments and the department that handles the product page listings are different. When creating cases, you can request that it gets escalated to the right department. It’s not always perfect, but it does get a lot easier to resolve complaints with time and expertise. Brand Management: Amazon now offers a service called Brand Registry which allows you to take complete control of your listings and prohibit any changes by third party sellers. We help our clients get their product’s brand registered and then work with them to create beautiful listings to attract new customers. Can you briefly describe what you do for a company that wants to sell on Amazon? How much does it cost? Without proper guidance, many people fail at selling their products on Amazon or become frustrated by learning the system. When done well, the benefits are amazing: Better control over your brand presence and increased margins. We offer two unique types of partnerships: Exclusivity and Account Management. Exclusivity: This means we will buy products from you at wholesale price and be your only authorized seller on Amazon. We’ll manage your supply chain, monitor and optimize your listings, and provide a single point of contact for a publisher wanting more control over how their products are listed. Account Management: This is the long-term approach where we work with you to create an Amazon account for your company. This allows brands to reap the increased margins that come with direct to consumer sales! Outsourcing your account management to us allows you to represent yourself on Amazon while staying focused on creating great games. If a publisher wants more control over their games on Amazon through these methods, who enforces it? Amazon? The distributors? The publisher? Amazon will not prevent sellers from going on listings. There are a few companies who will try methods such as Cease and Desist letters, but that enters a very tricky legal grey area and I don’t recommend it. Distributors can’t control how retailers sell their products, but they can control which retailers they sell too. If a publisher has a specific policy–like a MAP (minimum advertised price) or Amazon-specific policy–and a retailer violates that policy (as reported by the publisher), the distributor can stop selling those products to that retailer. Publishers only have direct control if they have a No Amazon Sellers agreement with all of their distributors. I think it’s a common perception that any third-party seller can drive down the price on Amazon, or even that Amazon can offer a super low price—we’ve all seen deep-discount flash sales of popular board games. Do you think that’s good for a brand? Do you have more control over that than a publisher who doesn’t use your service? It’s sad to see these types of flash sales on board games, because having the value of your product lowered is not a sustainable business model. When a designer or publisher partners with us, we can ensure this will not occur (unless it’s something both parties believe is a good move for the game). Why can we ensure this? Because we will be setting the price, whether through an exclusive relationship or through your own Amazon account. We sit down with our clients and talk about how to manage the supply chain to have that control. It’s not fail-proof, and will take some time and communication with distribution partners. However, the end result is that you have control over your listing and the price and that’s healthy for the long-term sustainability of your company. Back when I used Amazon multi-channel fulfillment, Amazon.ca, Amazon.co.uk, and Amazon.de, not just in the US. What are some of the challenges associated with coordinating so many different Amazon channels? I remember spending a ton of time inputting the same product information on each Amazon site, as there wasn’t a centralized hub for all of them. Is entering that information part of the service you provide? It absolutely is a part of our services. We found that instead of creating and managing an account for every retailer on the international platform, and dealing with the logistics of compliance, we sell it on our own account on behalf of the retailer on international platforms. And, to ensure accuracy, we use a team of translators for all international listings. We are currently operating in Amazon Europe (UK, Germany, Spain, Italy, France), Canada, and Australia. 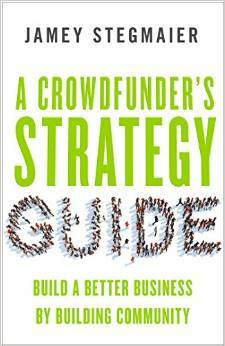 Is there anything else you’d like to share with crowdfunders and entrepreneurs who are considering selling on Amazon? There are very few industries populated with such a wealth of entrepreneurs like the board game industry. Amazon is a huge gift to small entrepreneurs with its ability to sell straight to the consumer. I’d love to see everyone succeed, but it can also be challenging to do it well. We’d love to work with you to make sure you thrive so you can focus on making amazing board games for all of us! Thanks so much for sharing your detailed insights, Hasan. I really appreciate it. If you have any questions for Hasan or want to share your thoughts on Amazon, feel free to do so in the comments or contact Hasan through SamePageBranding. In this very helpful post, Same Page Branding states the cost for their Exclusivity Services but not anything for Account Management. Assuming that there is a range for the latter depending on extent of services, are there any benchmarks you (SPB) can provide? It’s Hasan here from Same Page Branding. We really did want to put a price down for our services, but unfortunately there’s just too many variables that are at play and we like to customize our solutions to our clients needs. We recommend the exclusivity for smaller size companies as our Account Management services works on a monthly retainer that can be anywhere from a thousand to several thousand dollars a month depending on how extensive the needs of the client are and what additional services we’re offering. We’d be excited to work with you so please reach out on the website’s contact form or just email me directly at hasan@samepagebranding.com! I urge Amazon customers to complain to Amazon whenever they receive subpar packaging that results in any, even minor, product damage, and request compensation. Amazon will grant compensation, and hopefully, if enough customers complain, someday do better.